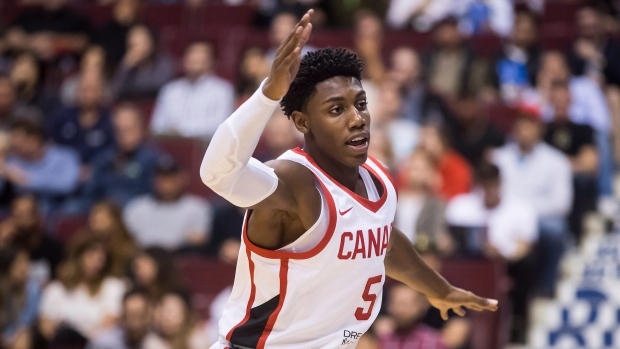 VICTORIA — R.J. Barrett had a game-high 21 points as Canada's men's senior basketball team beat China 108-72 on Sunday in the back half of the Pacific Rim Basketball Classic. The 18-year-old Barrett, from Mississauga, Ont., made his national senior team debut on Friday when Canada beat China 97-62 in Vancouver. "Huge honour. I try to represent my country every year if I can and I'm definitely thankful I got this opportunity," said Barrett. Canada had four players score in double digits by the end of the third quarter in Sunday's rout. Andrew Nembhard contributed 18 points as the Canadians hit 20 three-pointers in the contest. The Canadians open with a 12-2 run and led 22-4 after the opening quarter. Dillon Brooks had seven first-quarter points and Canada carried a 24-point advantage into halftime. "I liked our defensive intensity," said head coach Jay Triano. "I think we have to be a little bit more better with our communication on defence. As the game went on today, I thought we let them kind of get some open looks that we usually do a pretty good job of taking away." The two-game series was a warmup as Canada prepares for World Cup qualifying matches against the Dominican Republic on Friday at Toronto's Ricoh Coliseum and the U.S. Virgin Islands July 2 at Ottawa's TD Place.